Wasteful Mansfield Town had only themselves to blame for this afternoon’s 2-0 home defeat by title-chasers Plymouth Argyle. 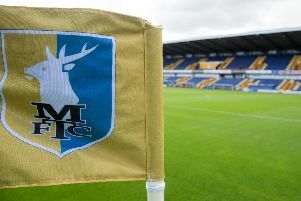 With Stags wasting a wealth of first half chances to score, the visitors had not even managed a shot on target until the 69th minute when they scored against the run of play before sealing the points five minutes later, Graham Carey making the first and scoring the second. For so long leaders in the division, Plymouth’s recent stutter of one win in six had seen them drop to second place. But Carey’s magic saw them pull off a win against the odds – their third win over Mansfield in all competitions this season – and left Steve Evans’ men with only two points from the last nine and facing a tough trip to Colchester on Tuesday. There were plenty of fine home performances with Joel Byrom pulling the strings in the middle, Alex MacDonald a constant menace and Hayden White in fine form on the right. But a third game without a goal saw Stags’ hopes of a return to the top seven ended for this weekend. The home side showed two changes with top scorer Matt Green returning up front while Byrom was restored to central midfield with Paddy Hoban and Jamie McGuire left out. Frontman Danny Rose was also back from injury on the bench. Quite how the Stags failed to score in a dominant first half is a mystery. They had eight shots, five on target, compared to Argyle’s one shot off target and the visitors will have gone in relieved to be on level terms. Ben Whiteman was inches wide of the far post and MacDonald saw his shot from a narrow angle saved by Luke McCormick in an exciting first three minutes as Mansfield started on the front foot. Matt Green just failed to life a poor Gary Sawyer backheader over the keeper and MacDonald volleyed tamely at McCormick before we had even reached the 10-minute mark. Plymouth’s one chance came on 18 minutes when Carey lifted a central 20-yard free kick over the wall but narrowly wide. The home side resumed the offensive and MacDonald was well over after great work by Green, then on 27 minutes Whiteman sidefooted the best opening wide from 16 yards after great approach play by Benning. Rhys Bennett headed a corner at the keeper and MacDonald sent a free kick at him before the break. The momentum was not lost in the interval and soon after the break McCormick had to quickly change direction to keep out Hamilton’s far post header. MacDonald then warmed McCormick’s hands with a low 20 yard first time shot from the right. Almost inevitably, the visitors broke the deadlock with their first effort on target on 69 minutes. Carey thought he’d won a penalty from Hamilton’s challenge, but the referee adjudged a free kick just outside the box on the right. Carey floated that to the far post and Bradley was unmarked to power home a close range header. The points were then sealed by an outstanding free kick by Carey five minutes later. Pearce brought down Carey 25 yards out and Carey picked out the top left corner with sublime ease. Over the 90 minutes Stags had eight shots on target and seven off with Argyle producing just two on target and one off. The corner count was also 7-1 in Mansfield’s favour, but in the end all that pressure counted for nothing. STAGS: Shearer, White, Pearce, Benning, Benning, Collins (Rose 76), Whiteman, Byrom, Hamilton, MacDonald (Potter 84), Green (Coulthirst 76). Subs not used: Jensen, McGuire, Baxendale, Arquin. PLYMOUTH: McCormick, Threlkeld, Sokolik, Bradley, Sawyer, Songo’o, Fox (Miller 88), Carey, Donaldson, Slew (Jervis 62), Taylor (Spencer HT). Subs not used: Bulvitis, Blissett, Tanner, Dorel. REFEREE: Richard Clark of Northumberland. CHAD STAGS MAN OF THE MATCH: Joel Byrom.